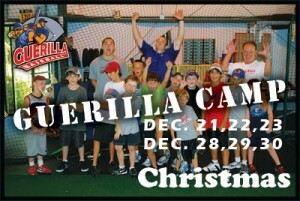 Sign up today for the Christmas Guerilla Baseball Camps! We will be running two camps this Christmas. The first camp will start on December 21,22,23. The second camp will run on December 28,29,30. The camp times are each day from 10am to 1pm. Bring your glove, bat and tennis shoes. The rumour is that Santa Claus may show on the 23rd. The price for the each 3 day camp is $99. You can sign up here or at the facility. When signing up online select “Christmas Guerilla Baseball Camp” where it asks for “Membership Type.” You can make payment online or at the facility as well.